HTC fans rejoice, as new info about the upcoming One A9 high-end smartphone have just surfaced online. The new device that the Taiwanese company plans to unveil in the coming weeks is also known as HTC Aero, the its market name is still unknown. According to GizmoChina, citing a new benchmark of the alleged HTC One A9, the company's new smartphone will be one of the most powerful it ever launched. If the latest smartphones released by HTC did not appeal to you, then the One A9 might be the device you're looking for especially if you're into high-end devices. 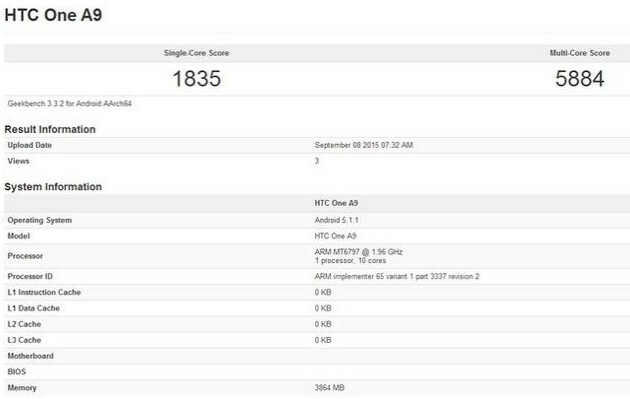 The benchmark leaked in China recently reveals that HTC One A9 will be equipped with a powerful 64-bit 2.5GHz deca-core MediaTek MT6797 chipset. MediaTek's chipset features a Tri-Cluster design with dual 2.5GHz Cortex-A72 cores for heavy work, four 2GHz Cortex-A53 cores for medium use and four 1.4GHz Cortex-A53 for light operations. The smartphone scored an impressive 5884 score in Geekbench multi-core test, which is much higher than Samsung Galaxy Note 5's Exynos 742 performance, which managed to score only 5375 in the same test. On top of that, the HTC One A9's powerful processor is complemented by no less impressive Mali-T880MP6 graphics processing unit and 4GB of RAM. Also, previous rumors claim the One A9 will boast a Quad HD (2560 x 1440 pixels) or full HD (1080p) display of unknown size. Confusion still reigns over all the info about the smartphone's screen for the moment, but as we're getting closer to launch we expect more details to emerge. Other than that, we expect HTC One A9 to be available at all major carriers in the United States. As for the price, word is the upcoming handset will be priced at around $500 - $600 outright.